Regiment/Catrawd: Royal Engineers, 81st Field Company. Military Cemetery/Memorial / Fynwent milwrol: Blighty Valley Cemetery, Authille Wood, Somme, Picardi. Medals Awarded / Medalau a ddyfarnwyd: British War Medal, Victory medal, 15 Star. 23rd November, 1916. Age 24. Died by accident. Roland (or Rowland) Arthur Jones was the son of Arthur Llewellyn and Isabella Margaret Jones. His birth was registered in the last quarter of 1892, at Prestwich, Manchester. In the 1901 census for wales, available on Ancestry, the family are living at 4 Gronant Terrace, Prestatyn. Head of the family, Arthur Llewellyn Jones, was 31 years old and described as a railway labourer. He had been born at Rochdale, Lancashire. His wife, Isabella Margaret, was 29, and had been born at Rhyl. Rowland Arthur was 8, born in Manchester, while Florence, who was 5, and Charles age 1, had both been born in Prestatyn. In 1911, the family were living at 2, Catherine Villas, Sandy Lane, Prestatyn. Arthur Llewellyn, 41, is described as a joiner. Isabella Margaret, 39, had given birth to 3 children in 19 years of marriage, who were all living. Rowland Arthur, 18, is now a joiner, Florence is a dressmaker, while Charles is at school. There were ten rooms in the house, and all the family spoke only English. In the website Soldiers who Died in the Great War, Rowland’s birthplace is given as Manchester, his place of residence as Liverpool, and his place of enlistment as Rhyl. Rowland Arthur’s Service records have not survived, and there is no card for him in the Roll of Honour in the archives at Hawarden. There is an entry in the Medal Rolls Index for our soldier. We know that he must have changed regiments from the Royal Welsh Fusiliers to the 81st Field Company Royal Engineers, who were with the 19th Western Division, and he was serving with them at the time of his death. This record gives his rank as sergeant in the Royal Welsh Fusiliers, but this is not found anywhere else. He left Southampton for France on 19th July 1915, and disembarked there the next day. At the time of our soldier’s death, this division had been fighting at the Battle of the Ancre, the last of the large British attacks on the Somme. We do not know what type of accident caused his death, but in addition to the usual hostilities, the Sappers worked with dynamite and earth moving equipment. There is a note on this card that Mrs Jones had applied for the 1914 Star on behalf of her late son. He was not eligible for this, but was awarded the 1915 Star. 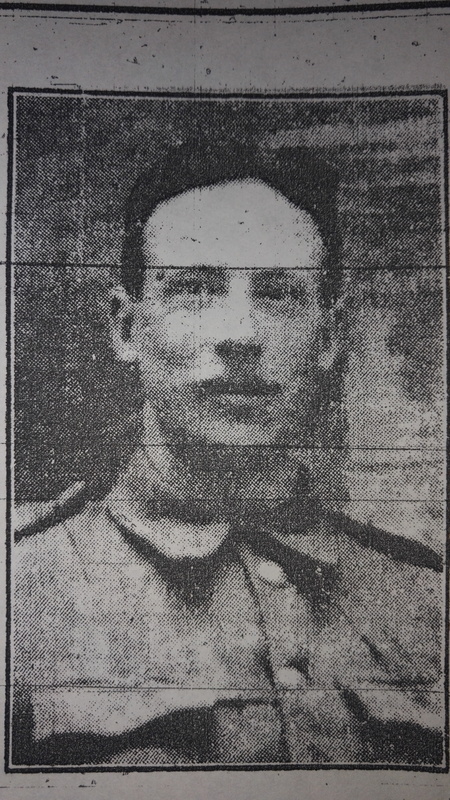 In the Prestatyn Weekly December 16th, 1916, there is a report of Rowland Arthur’s death in France, as the result of an accident. In the website UK Army Register of Soldier’s Effects, which records monies due to deceased soldiers, we see that his mother Margaret received £1 0s 6d. The fact that he died by means of an accident in France, is noted here. Jones – In sad but loving memory of our dear son Arthur, age 25 years, who was accidentally killed November 23rd 1916, and was buried with full military honours – eldest son of Mr and Mrs Jones, late Catherine Villas, Prestatyn. From mother, father sister and brother, 49 Beaconsfield Street, Liverpool. For the one she loved so well. From mother, father, sister and brother, late Catherine Villas, Prestatyn. Roland Arthur is also commemorated on the Battle of the Somme Roll of Honour website.